This post is an invitation for you to use the voting system in Developer Community. Once registered in Developer Community you can vote! You can vote both for articles, questions and announcements, and for answers and comments too. Voting is the fastest and evident way to express your like or dislike for the posting. To do the vote choose thumbs up as positive and thumbs down for the negative vote in the control below the every posting. You can see the most voted postings ever in the most votes filter, which you can find on top of the feed. Every month we post the digest, where you can see Top-10 most voted postings of the month. 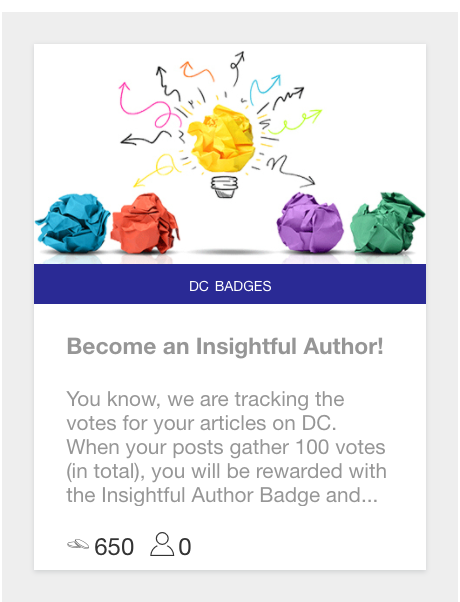 Last week we introduced the "Insightful Author" badge in Global Masters (see the picture above) for Developer Community member who reaches 100 votes for the postings. It also adds 650 points to your Global Masters account. Please, bring us the ideas how we can use the Developer Community voting system better e.g. with comments to this post.